I've been asked to draft an 1860's shirt pattern for a gentleman with a 56 chest - and 62 inch waist. The draft I usually use (DeVere, 1859) has straight side seams, and has the front gathered into the bottom of a pleated bosom. I can let out the gathers, but that will only make the chest and waist equal. 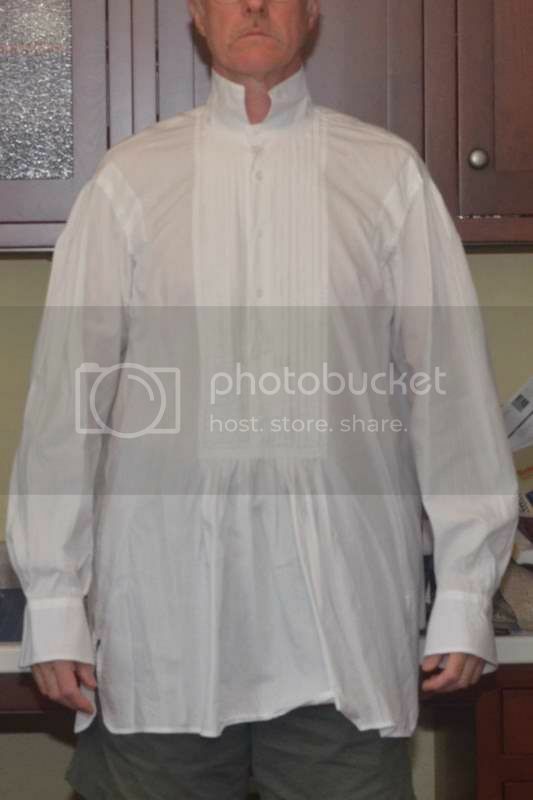 Are any costumers here aware of a period shirt draft for a corpulent man? Without one, how would a modern shirtmaker approach this? Slant the side seams out at the waist, or something else? I can only answer how I do it. Give some slant on CF and some ( but less) on the side seams. Rotate the front pattern later so that the CF is in grain. Another method is to use the waist circ for bust circ. Here you get a wide shoulder. It depends on where the fat is. It can be all in front, or, some on the sides, and even, some in back. Thank you both. From the picture I was sent, the fat is all to the front. However, shirts in this period were not split all the way to the tail; the one-piece front is split only to waist level. So, slanting the CF line is not an option. It is still the way to do it, because it has to do with the scye. Also, the waist is probably an inch or two lower at cf. 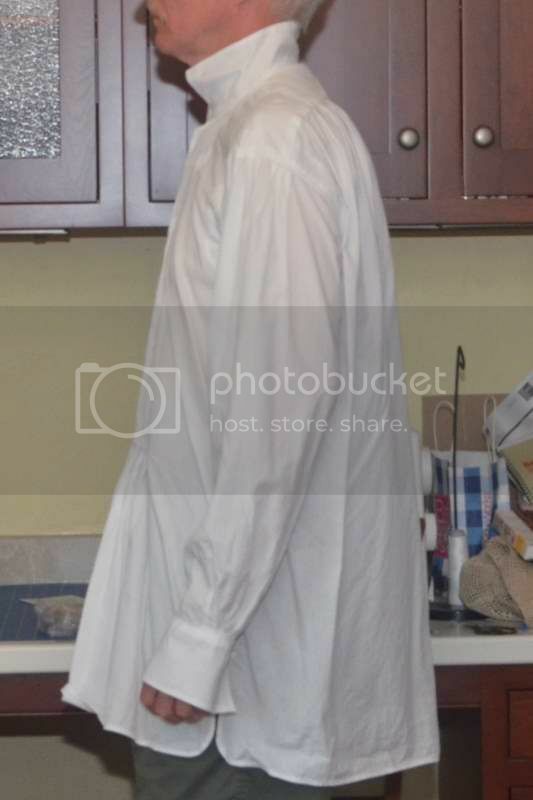 Probably a modern customer wants his shirt to fit in the body, but a shirt for any body type in 1860 is pretty much a sack from the 'yoke' down. Even a corpulent shirt should be balanced. Might surprise you, Henry. The shirt pictured came from a draft published by Louis DeVere in 1859. I proportioned it to my chest size and adjusted the collar, sleeve and overall lengths to my body measurements. No adjustments were made for balance. The shirt fits in the front shoulder area and is actually snug across the upper chest. The back is way oversized and is gathered or pleated into the yoke as shown. The lower front gets its shape and waist suppression by making the cutout for the bosom quite wide and gathering the excess material along the bosom bottom as shown. For a corpulent subject, the width of this cutout could be reduced, but the front is one continuous piece from side seam to side seam. I suppose I could make the cutout V-shaped, which would allow extra width at the waist without splitting the front to the hem. It needs more front length/balance. It still looks like its tipping up, like a struck bell or swing that wants to fall back down. That's what is unsettling to the eye. The way this shirt fits me isn't the issue here. I just wanted to show Henry that it's not just "a sack from the yoke down". The guy I'm drafting the pattern for is much bigger than me - 56 inch chest vs 40. He is also far more corpulent - 62 inch waist (6 over chest) vs my 38 (2 inches less). I wondered why it was so big around the middle. This is the last shirt (linen - Bamboo) I sewed when I asked about sewing pleats. It is done after the draft I showed above. Bust was 132 cm waist was 142. It is cut on fold. There is a cut out for the button stand, 2 pleats on each side. The pleats are sewn to the yoke's end. The yoke ist embroidered and sewn on after the pleats are closed. Underneath the yoke the pleats are hanging "free". With a period shirt such as you posted, you can hide the dart shaping in the vertical bib seam. The bib in most of those drafts is calculated to the waist in the front, often with a handy tab to button into the trouser waistband if desired. Of course that may be a slightly later technique. You need to adjust for corpulence first. The excess fabric that drapes under the belly in the draft, would be rotated/transferred to the bib seam. 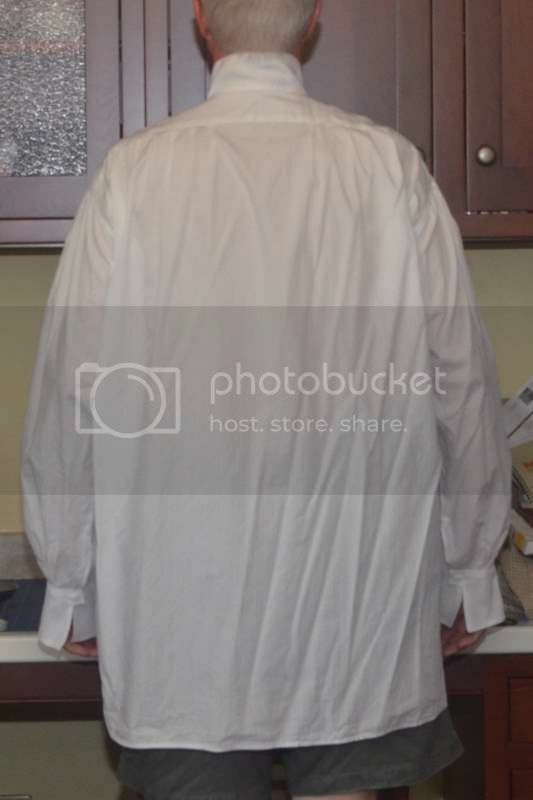 I don't hink I have seen a proper period corpulent shirt draft, I think it was just assumed that the maker would know what adjustments they needed to make from the basic, or they didn't care because the shirts were not form fitting as today, and were never seen on their own. Just conjecture on my part. Here is the whole book.